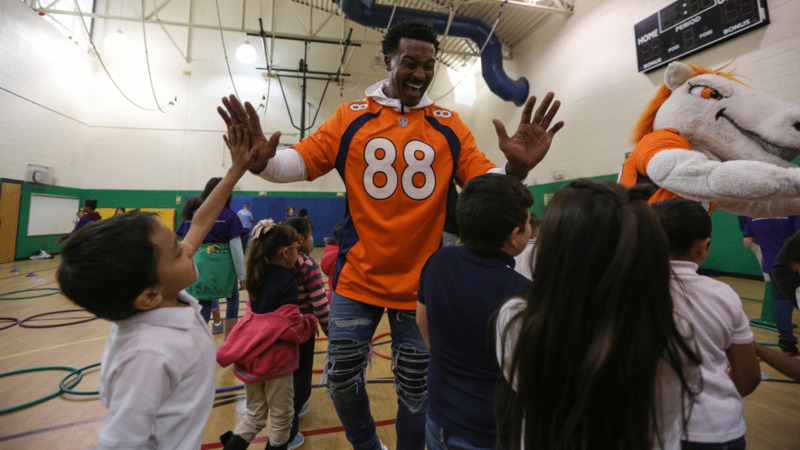 Demaryius Thomas and Courtland Sutton spent their Tuesday morning at Marie L. Greenwood Academy, playing games and dancing with kids as part of a Playworks recess visit with help from volunteers from CarMax. CarMax also donated $10,000 for play equipment. Demaryius Thomas gives high-fives at a Playworks recess visit (alongside CarMax volunteers) with first-, second- and third-grade students at Greenwood Academy on October 9, 2018. 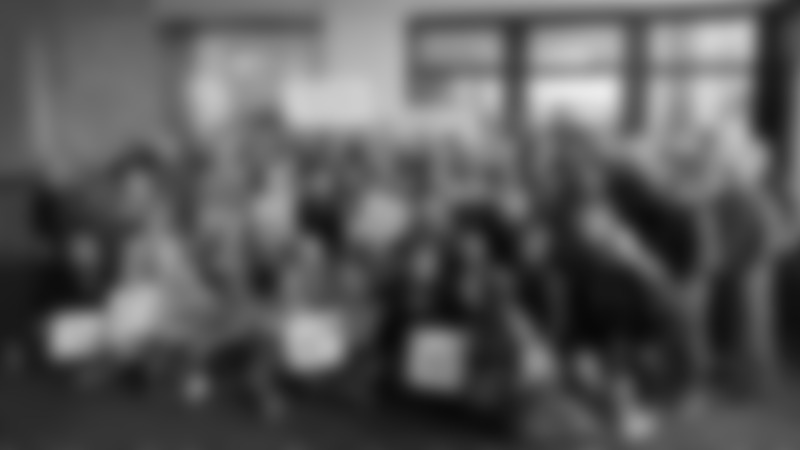 Demaryius Thomas at a Playworks recess visit (alongside CarMax volunteers) with first-, second- and third-grade students at Greenwood Academy on October 9, 2018. Demaryius Thomas plays rock, paper, scissors at a Playworks recess visit (alongside CarMax volunteers) with first-, second- and third-grade students at Greenwood Academy on October 9, 2018. Miles the mascot at a Playworks recess visit (alongside CarMax volunteers) with first-, second- and third-grade students at Greenwood Academy on October 9, 2018. Demaryius Thomas jumps rope at a Playworks recess visit (alongside CarMax volunteers) with first-, second- and third-grade students at Greenwood Academy on October 9, 2018. Courtland Sutton dances at a Playworks recess visit (alongside CarMax volunteers) with first-, second- and third-grade students at Greenwood Academy on October 9, 2018. DBC Erica S. at a Playworks recess visit (alongside CarMax volunteers) with first-, second- and third-grade students at Greenwood Academy on October 9, 2018. Courtland Sutton at a Playworks recess visit (alongside CarMax volunteers) with first-, second- and third-grade students at Greenwood Academy on October 9, 2018. DBC Erica S. dances at a Playworks recess visit (alongside CarMax volunteers) with first-, second- and third-grade students at Greenwood Academy on October 9, 2018. Courtland Sutton and DBC Erica S. dance at a Playworks recess visit (alongside CarMax volunteers) with first-, second- and third-grade students at Greenwood Academy on October 9, 2018. Courtland Sutton gives high fives at a Playworks recess visit (alongside CarMax volunteers) with first-, second- and third-grade students at Greenwood Academy on October 9, 2018. Miles the mascot gives high-fives at a Playworks recess visit (alongside CarMax volunteers) with first-, second- and third-grade students at Greenwood Academy on October 9, 2018. Demaryius Thomas gives a high-five at a Playworks recess visit (alongside CarMax volunteers) with first-, second- and third-grade students at Greenwood Academy on October 9, 2018. Courtland Sutton and Demaryius Thomas at a Playworks recess visit (alongside CarMax volunteers) with first-, second- and third-grade students at Greenwood Academy on October 9, 2018. Demaryius Thomas plays rock, paper, scissors with DBC Breanna at a Playworks recess visit (alongside CarMax volunteers) with first-, second- and third-grade students at Greenwood Academy on October 9, 2018. Courtland Sutton plays rock, paper, scissors at a Playworks recess visit (alongside CarMax volunteers) with first-, second- and third-grade students at Greenwood Academy on October 9, 2018. DBC Breanna jumps rope as Demaryius Thomas swings the rope at a Playworks recess visit (alongside CarMax volunteers) with first-, second- and third-grade students at Greenwood Academy on October 9, 2018. Demaryius Thomas jumps rope with DBC Breanna at a Playworks recess visit (alongside CarMax volunteers) with first-, second- and third-grade students at Greenwood Academy on October 9, 2018. DBC Breanna plays rock, paper, scissors at a Playworks recess visit (alongside CarMax volunteers) with first-, second- and third-grade students at Greenwood Academy on October 9, 2018. Demaryius Thomas and Courtland Sutton at a Playworks recess visit (alongside CarMax volunteers) with first-, second- and third-grade students at Greenwood Academy on October 9, 2018. Demaryius Thomas, Courtland Sutton, DBC Erica S., DBC Breanna and Miles the mascot take a group photo with volunteers and Playworks junior coaches with the donation from CarMax to Playworks at a Playworks recess visit (alongside CarMax volunteers) with first-, second- and third-grade students at Greenwood Academy on October 9, 2018. Paul from CarMax talks about the company's donation to Playworks at a Playworks recess visit (alongside CarMax volunteers) with first-, second- and third-grade students at Greenwood Academy on October 9, 2018. Demaryius Thomas and Courtland Sutton applaud CarMax's donation announcement to Playworks at a Playworks recess visit (alongside CarMax volunteers) with first-, second- and third-grade students at Greenwood Academy on October 9, 2018.